Most people work for a living, which means they go somewhere to do something to make money in order to pay their bills. This is the norm. Interestingly, the types of work environments are all very different, from office cubicles to little retail shops—diversity is the name of the game. All too often, the “aesthetics” of a workplace get forgotten in favor of utility and profits. But that’s not necessarily a good idea. Have you ever been to a waiting room with no art on the walls, no TV, no magazines—just chairs. It’s not the most pleasant feeling having to wait in what feels like a prison cell. Or perhaps you work in a place that’s lacking the things that make it feel comfortable and “homey.” Regardless, improving the aesthesis of a workplace could help enhance the mood of employees and customers alike. 5) Once a week, splurge on a cookie or veggie tray for all to enjoy—workers, customers, visitors. Why not? 4) Go to local yard sales or art stores (depending on your budget) and buy some pieces of art to hang on the walls or place on tables. Unusual sculptures, bright-colored paintings, and/or funky knick-knacks will enhance a space. 3) Invest in an aquarium of colorful, lively fish or allow a pet cat, for instance, to roam the office. There’s something very comforting about pets—they typically cheer people up. 2) Who doesn’t like prizes and giveaways? Think of some games people can play to win something big or small. 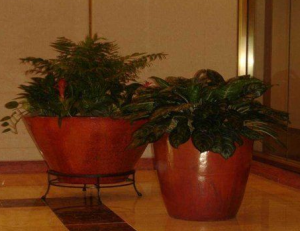 1) Decorate an otherwise drab room or hallway with live indoor plants. Greenery and flowers warm up a room, and remind you of the outdoors. fdsbham@bellsouth.net to ask about having plants liven up your office space.